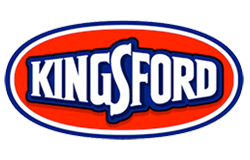 Kingsford is a popular and trusted brand of charcoal used mainly for grilling. Owned by The Clorox Company, the brand has been around since the early 1920s when Ford decided to use the discarded wood scraps from his motor company and turn it into charcoal. Today, the company is the biggest manufacturer of coal in the US. To expand their influence, the company has also partnered with some grill manufacturers such as Masterbuilt and Rankam Metal Products to build charcoal grills and sold under their brand. This is a pretty decent grill manufactured by Masterbuilt in China and sold under the Kingsford brand. The grill comes with a cast iron cooking grate that has 360 square inches of cooking space. The warming rack is 205 square inches. The steel lid has a high temperature black paint finish and adjustable vents. The firebox also has adjustable side vents. The grill has a foldable side shelf with tool hooks, two wheels, and an attached bottle opener. There’s a door that enables you to add charcoal to the firebox while you’re cooking and the coal tray can be raised higher or lower, depending on how much heat you want on your meat. For cleanup, the removable ash tray is quite easy to use – just pull it out and dump the ash. The grill also comes with a temperature gauge. There is plenty of praise for the Kingsford 24″ Charcoal Grill. It cooks every type of meat imaginable and does so perfectly. The only complaint would be that the temperature gauge isn’t accurate (as is with most grills anyway) and so it takes some time to figure out how to control the heat to get the meat to cook just the way you want. But once you get the know-how, everything is a breeze. The design of this grill allows you to do direct cooking and indirect cooking so it’s a great deal more versatile than many other grills in this price range. The materials used in this grill seem to be of good quality. The only problem is rust (as does most grills made of metal) but with proper care and a good grill cover, this grill was made to last. One minor thing to keep in mind. The grill isn’t airtight when closed so it can’t help you save charcoal. For the price, though, it’s a minor setback to everything you’ll be getting. 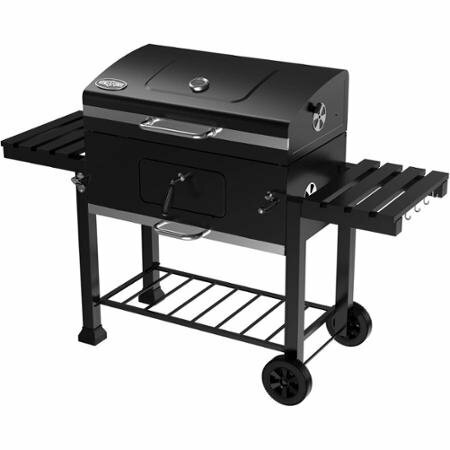 The Kingsford 24″ Charcoal Grill has a big brother – the 32″ Charcoal Grill. The features all remain the same except for the size and the addition of one more foldable steel side shelf. With this grill, you get 495 square inches of primary cooking space on the cast iron grate and 273 square inches on the warming rack. The cart has a powder coating, a bottle opener, and a rack on the bottom for extra storage. The two foldable side shelves have tool hooks. For airflow, you get adjustable side vents on both the lid and the firebox. The firebox has an access door for the charcoal, a removable ash pan, and an adjustable coal grate. lacks a handle for when you want to pick up the grill (on one side) and roll it. some of the grills have a thin paint coat which can get scratched while assembling so you need to spray a bit of high heat paint to ensure that it doesn’t get scratched and start rusting. Overall, this is a great grill sold at a very low price. 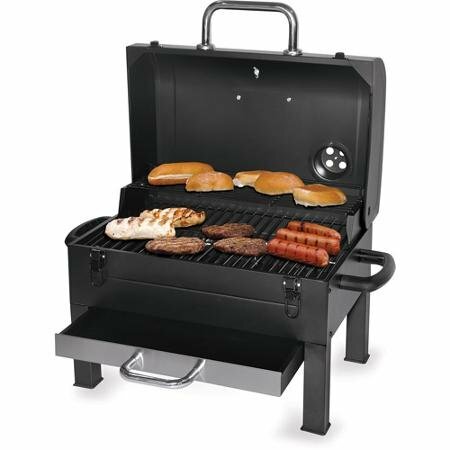 Other grills of this size generally cost a hundred dollars more. It grills and smokes meat to perfection. Controlling the heat is very easy due to the adjustable side vents and the fact that the lid closes real tight. The grill is also very sturdy with some small exceptions. However, it needs a bit of TLC to ensure that the grill lives to serve you for a long time. While it’s definitely not a Weber, this grill gives you great value for your money. 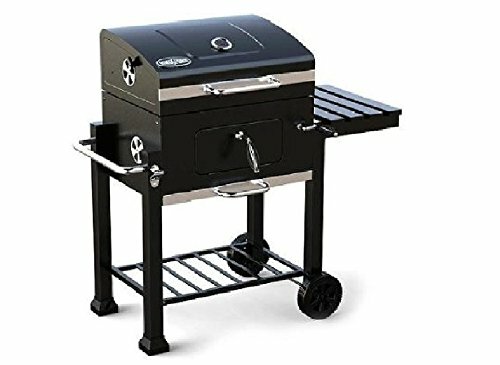 If you want a charcoal grill that gives you a lot of joy with only a small amount of frustration at a very affordable price, you should visit your local Walmart to check this one out. If you’re looking for something bigger, Kingsford offers a 30″ barrel grill that’s perfect for feeding your hungry horde. With a porcelain-coated cast iron cooking grate that’s 793 square inches, you can cook 24 burgers at once. 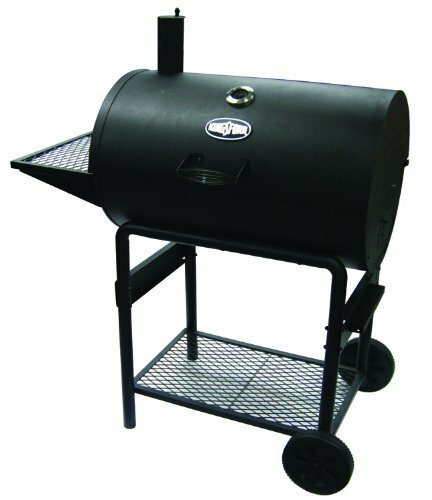 The heavy duty grill also has an oversized analog thermometer, a wire rack for storage (at the bottom), adjustable side vents, a chimney, wheels, an adjustable coal tray, and a removable ash tray. The grill doesn’t seal tight so a bit of smoke leaks out and makes it a bit difficult to control temperature. You also cant smother the coals when you’re done to save them for the next cookout. It’s easy to find complaints about this grill such as the fact that the grill doesn’t seal tight. However, for a grill of this size and design, there’s no question that you’re getting a great deal at its current price. You get a nice charcoal grill that can cook loads of food at a time. You don’t have a hard time cleaning the grill and controlling the temp may be a tad difficult but not frustrating. While the metal isn’t thick, it looks and feels quite sturdy so you don’t have to worry about replacing this grill for something else next year. If you love grilled food while camping or at picnics and tailgate parties, Kingsford is offering a charcoal grill right up your alley. This portable grill has 240 square inches of primary cooking space plus an 85 square inch warming rack. You’ll be able to cook 14 burgers at a time, perfect for a small party with family and friends. For a grill that’s under 50 dollars, this grill exceeds expectations. Yes, the grill could have been made of sturdier material and a lot easier to assemble. But at this price point, all you want is a grill that will cook your brats, burgers, hot dogs, and steaks really well while you have fun with your family or friends at a tailgate party (or something similar). And this grill definitely lets you do that. While it probably won’t last long enough for you to pass it on to the next generation, it’ll probably last several seasons if you take care of it properly. With this grill, you definitely get more than you pay for. If you need a portable grill for the summer but you don’t have much moolah for a really good one, the Kingsford 325-sq in Portable Charcoal is your best bet. temperature gauge isn’t accurate so you’ll need to buy a new one. It’s also very fragile and can break while assembling the smoker. some units aren’t as well made according to some reviewers who complain about the large amount of heat and smoke leaks that make it hard to control the temperature and cook food. For just $35, you get a decent little smoker/grill that you can take with you on overnight camping trips. While it doesn’t wow you with its performance, it gets the job done with a minimum of fuss. It’s easy to use and the access door is a real plus. Just like with any other low-priced grill or smoker, there are flaws with the design. And this smoker probably won’t last as long as a Weber. But at this price, you just can’t complain. If you want to truly invest in a smoker for your home and travels, this may not be the one for you. 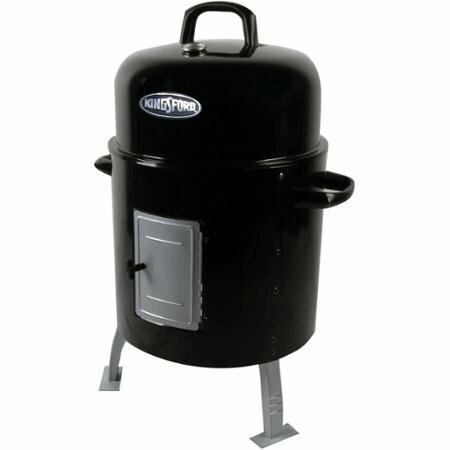 But if you’re not going for the bells and whistles and you simply want a small smoker to fit your very simple needs, then you just might have found the right one with this Kingsford Charcoal Water Smoker.